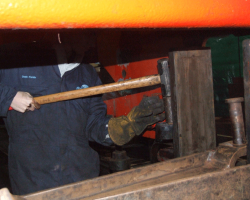 The SVR staff were busy on the loco today dealing with the bushes for the horn guide cross stays. All pins had previously been removed, but the steel bushes inside were being replaced. 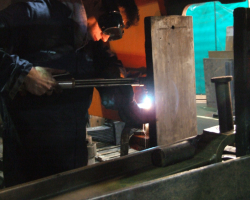 Some of these resisted all efforts to press them out and resource had to be made to oxy-acetylene burning equipment. Once a slot had been cut, the bushes came out, but some persuasion was still needed. Much of the day’s work concentrated on frame crack detection, led by Brian of the SVR staff, and the means of rectifying any found. 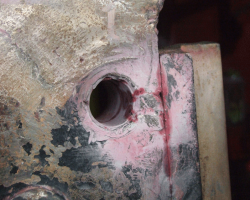 The horn gaps were crack detected both inside and outside the frames, but none found other than the existing and known crack at the trailing side of the right hand driving horn. The two bolts from which the cracks emanate were removed today; the others will follow. 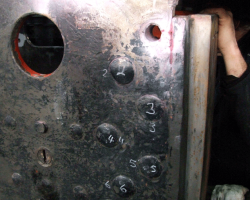 They have been marked up for possible reuse, although the plan is to return to rivets. These are the offending articles. 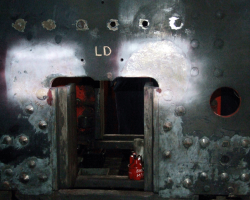 The hole is for a rivet and/or fitted bolt retaining the horn guide and a second, similar hole to retain a stretcher. It emanated both sides of the horn guide hole and into the edge of the frame itself, then upwards and rearwards to and beyond the stretcher hole. 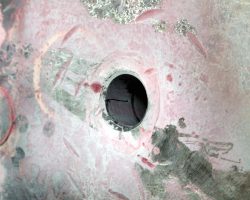 The area between the holes was repaired in 2012, so only the cracks beyond the two holes remain. These though extend the full thickness of the frame plate. 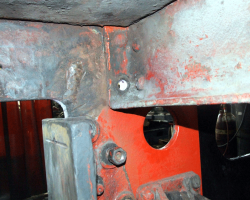 Thorough repair will require the removal of the horn guide, which in this isolated case is attached with fitted bolts rather than rivets.